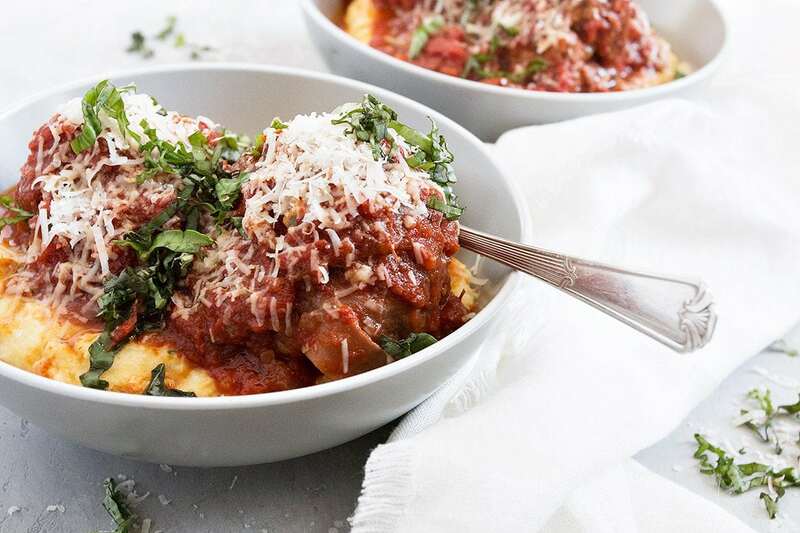 These big pork meatballs are wrapped in prosciutto, browned and simmered in tomato sauce, then served on top of polenta. 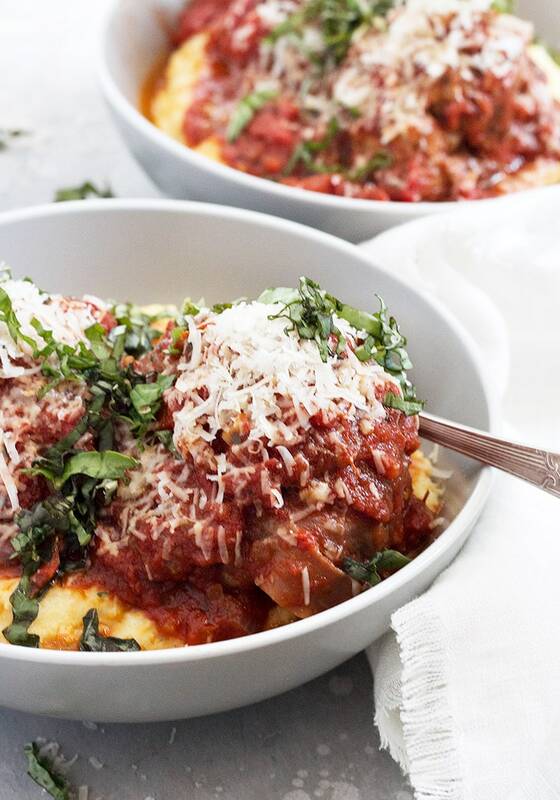 When it comes to classic comfort food, it’s hard to beat meatballs and polenta! 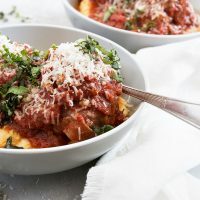 These Pork Prosciutto Meatballs and Polenta are faithful to the classic, with the addition of wrapping the large meatballs in prosciutto, for an extra layer of flavour. Beyond the prosciutto, this is a dish that rewards starting with great ingredients and the patience to allow the meatballs to brown well and then simmer long enough to marry all the flavours. Add a glass of your favourite red wine and you are all set for a special meal. 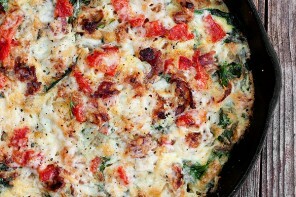 This is one of those recipes that will benefit greatly from great ingredients. Fresh herbs are great here, if you can. Fresh basil especially, works well in the meatballs, sauce and for garnish. If you don’t have fresh, use a bit less of dried herbs. A great can of tomatoes to start (San Marzano maybe) and a good sized chunk of a nice Parmesan will all take this dish up a notch. Speaking of Parmesan, note that there is Parmesan in the meatballs, the polenta and for garnish. You’ll want a good piece around to start. Be sure to taste and season with salt and pepper as needed. Obviously, you can’t taste the raw pork mixture, but you’ll want to add salt and pepper. While the prosciutto adds a bit of saltiness to the meatball as it cooks, it’s a big meatball so additional salting is probably in order. These are really big meatballs! An instant read thermometer is handy to ensure they are cooked through. You’ll want them to be 160F in the middle, at least. If you don’t have a thermometer, err on the side of simmering longer, rather than rushing them. 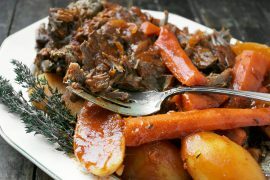 A longer simmer won’t hurt them and you can be sure they are cooked. Make ahead: You can make the sauce and meatballs and simmer them off ahead. Refrigerate the meatballs in the sauce, then simply re-heat while you make the polenta, to serve. Time tight or energy short? Skip a step by starting with a good, store-bought marinara sauce instead of making your own. Just be sure to buy enough – 30 oz. or 885ml – ish – so that your meatballs have enough sauce to simmer in. I put two meatballs per bowl for photographic purposes. One big meatball in the bowl just looked kind of goofy through the viewfinder :) Trust me though that one meatball with the polenta per person is sufficient for most appetites. 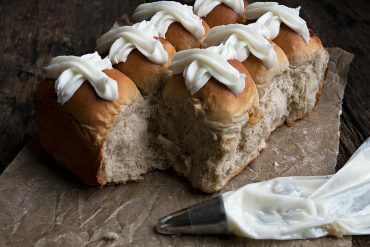 This delicious recipe is adapted from a Gourmet Traveler recipe. Big pork meatballs, wrapped in prosciutto browned then simmered in marinara sauce. Serve on top of polenta. Make the Marinara Sauce: Blend together the canned tomatoes, onion, garlic and herbs in a blender until smooth, or alternately in a large bowl with an immersion blender. Pour the mixture into a large saucepan. Add wine and olive oil, season to taste with salt and pepper and bring to the boil. Reduce heat and allow to simmer while you make the meatballs. For meatballs: Add all the meatball ingredients except the prosciutto and olive oil to a large bowl. Stir together until combined. Season to taste with salt and pepper. Divide the mixture into quarters. Take one quarter and roll into a ball, then wrap with a slice of prosciutto. Repeat with the other quarters. Heat olive oil in a frying pan over medium-high heat. Add the meatballs and brown well all over (3-5 minutes). Transfer the meatballs to the simmering sauce. Half cover the saucepan with a lid and simmer until meatballs are just cooked through, about 12-15 minutes. *If you have an instant-read thermometer, test the meatballs for done-ness by inserting in centre and ensuring that it is at least 160F. When meatballs are almost cooked, bring milk and water to the boil in a large saucepan. Gradually pour in polenta, whisking continuously, then reduce heat to medium-low and simmer, whisking regularly, until smooth and thickened. (about 20 minutes for long-cooking polenta or 5 minutes for instant polenta) Remove from heat. Add parmesan and butter and season generously with salt and pepper. Whisk well to combine. 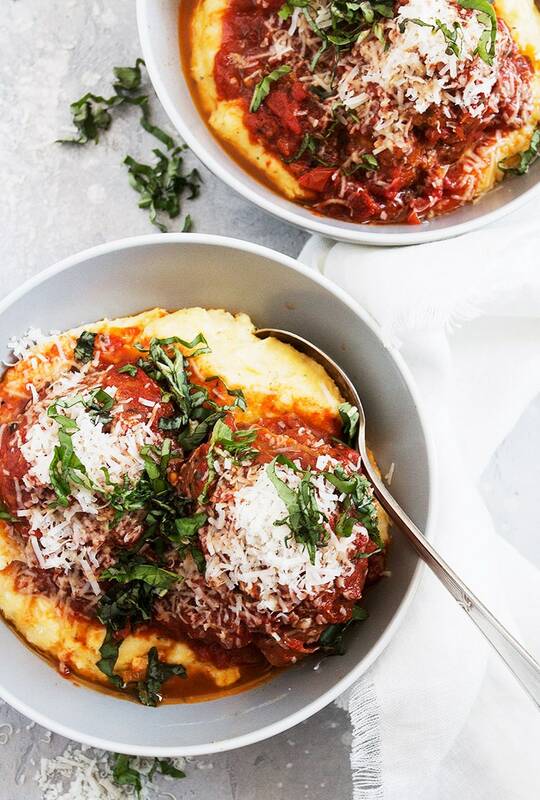 Serve polenta topped with meatballs and sauce, garnished with extra parmesan and fresh chopped herbs. I moved out of my comfort zone and made this meatball recipe for my Sicilian mother (who has passed down her meatballs & sauce recipe going back to my great grandmother). It passed the test and will go into my winter rotation. Even my ultra picky eater ate a meatball and a spoonful of polenta. So glad to hear, Jenn (and yes, I’m a polenta lover, too :) Thanks so much! Another delicious recipe! Used the San Marzano tomatoes and fresh herbs ( doubled the herbs in the sauce) 1/2 meatball was perfect for me and my husband was more than happy to “help” with the other half. So glad you enjoyed this! I could only eat half a meatballs, too, but they were great as left-overs the next day :) Thanks! What a delicious combination Jennifer! 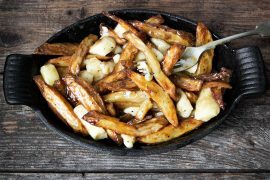 This is the perfect kind of winter comfort food. And just what we need right now with snow headed our way! Thanks Mary Ann :) And yes, great snowed in food! I love a dish that showcases and blends together quality ingredients and these proscuitto wrapped meatballs and polenta are just perfect. Definitely a recipe to keep handy! Thanks Milena and yes, this is a dish where great ingredients are the star, for sure! I made short ribs with polenta recently and I thought that was pretty comforting, but your meatballs have got that beat! I love me a good meatball and now I need to try it with polenta! Pinned! I’ve never tried meatballs with polenta – but I bet it is wonderful. Your marinara sauce sounds terrific – PINNING! Pork and prosciutto, what a delicious combination I never would have thought of! And the polenta is a wonderful pairing! I’m such a sucker for anyting Italian, but then again, who isn’t?